Tonight we start up our Bible study again on Thursday nights via Facebook live at 6:30pm. We will be doing a study on Not Just Healed but Whole. God’s abundant life for us… this FINISHED life… is not to be healed but knowing that we were made WHOLE… nothing missing, nothing broken, completely, perfectly whole! If you feel as if you are walking through the valley of the shadow of death and can’t see yet that you are seated FAR ABOVE where death has no dominion over you, God will meet you there. We are transformed not by the renewing of the mind, but by the renewing mind… the mind of Christ. Psalm 17:15 says As for me, I will see Your face in righteousness; I shall be satisfied when I awake in Your likeness. It’s time to wake up church and see that we are image and likeness of God…. we look just like Him! there is something much more important than what you think about God and that is discovering what He thinks about you! John 19:28-30:After this, Jesus knowing that all things were now accomplished, that the scripture might be fulfilled, saying, I thirst. (29)Now there was set a vessel full of vinegar: and they filled a sponge with vinegar, and put it upon hyssop, and put it to his mouth (30)When Jesus, therefore, had received the vinegar, he said, It is finished: and he bowed his head, and gave up the ghost. Indicative means a statement of absolute truth…spoken without a doubt! Perfect means a fully completed action with results of that action ongoing and with FULL effect. The work of man’s redemption and salvation was completed! A FULLY COMPLETELY redeemed… FULLY COMPLETELY saved (sozo)… lacking nothing! Nothing else needed or required from us – it indicates a position, a condition, a state of being, a RESTING place. It HAS BEEN completed – IS NOW complete – and WILL FOREVER REMAIN completed… IT IS FINISHED! Doing (or obeying) to be righteous… to be right with God. Mirror Bible: Christ is the conclusion of the law, everything the law required of mankind was fulfilled in him; he thus represents the righteousness of the human race, based upon faith (and not personal performance). Based upon faith…. who’s faith? Paul already established that in Romans chapter 3 verses 21-22: But now the righteousness of God without the law is manifested, being witnessed by the law and the prophets; (22)Even the righteousness of God which is by (the) faith of Jesus Christ unto all and upon all them that believe: for there is no difference. We see that in 1 Tim 4:10 The Living God is the Savior of ALL men, especially those who believe. Unbelievers… or pre-believers are just those who haven’t awakened to the realization that they were MADE righteous at the cross. and back to Rom 10:4He was the END of the law…. end of law = God NOT taken sin into account. God’s thinking, God’s thought, God’s intent or plans! Paul is saying we all fall short, we lag behind God’s thinking… not thinking His thought…. IT IS FINISHED! Falling behind in our understanding of the truth that we were made righteous by HIS FAITH at the cross. Genesis 1:27… created in the image and likeness of God! Usually we just stop at verse 23 and use it to convince people that they are sinners who have fallen short of God’s glory, needing to repent and get saved. And verses 24-26: Being justified freely by his grace through the redemption that is in Christ Jesus: (25)Whom God hath set forth to be a propitiation through faith in his blood, to declare his righteousness for the remission of sins that are past, through the forbearance of God; (26)To declare, I say, at this time his righteousness: that he might be just, and the justifier of him which believeth in Jesus. To be justified from God’s perspective is you have never sinned a day in your life… you are sinless! Innocent! Righteous! You are now free to discover God’s likeness and image in you; it means TO BE – you are now free to be who you always have been in the Father’s opinion… a son (or daughter), made in His image and likeness. Remember 1 Cor 8:7– however not all realize it (YET)! Verse 26 says He did this to demonstrate His righteousness at the present time, so as to be just and to justify the one who has faith in Jesus. This is how He demonstrated His righteousness..
All along God REFUSED to let go of mankind…. refused to allow them to continue in living inferior to their true nature… made in His image and likeness. That faith – His faith, NOT yours, persuades us that we have been justified and reconciled to God. It is His faith that embraces and undergirds me… my believing is merely saying “not I but Christ”… realizing that I am righteous because of His faith… I am reconciled because of His faith… and then resting in that finished work! We’re not reconciled or made righteous because we “believe”…we are already reconciled and righteous whether we believe it or not. We have always been justified and reconciled… we just haven’t always been aware of it. In other words, He would still be in the grave if the Father had not judged ALL mankind righteous, sinless, and innocent by the faith of Jesus! He was raised because the Father justified us. 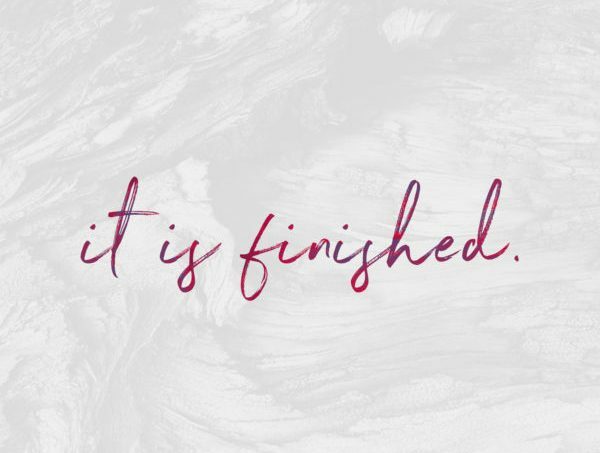 Jesus’ faith declared IT IS FINISHED! John 17:4:I have glorified thee on the earth: I have finished the work which thou gavest me to do. Cry is phóné meaning a sound, a noise; the root is phemi meaning to bring to light by asserting one statement. Loud is megas! Meaning abundant, fierce, huge, all the more, more important, strong, too much, very much! Make your cry of IT IS FINISHED loud… Make it all the more, too much… make it MUCH MORE and GREATER THAN anything else! We don’t have to fight to get it, AND we don’t have to fight to keep it or maintain it. who or what are you fight if a battle is finished and the enemy defeated? Jesus did a COMPLETE work… there is no just in case and never will be. Col 2:15:Having disarmed the rulers and the authorities, He made a show of them in public, having triumphed over them in it. IT IS FINISHED – you can safely lay your weapons down forever and simply REST in His finished work. But just how finished is finished? How far does it reach? We’re going to look at that over the coming weeks…. how He has made you completely WHOLE, LACKING NOTHING. Maybe the reason is what are believers believing? What should our finished life… a life rooted in IT IS FINISHED believing… look like? Paul showed us in Galatians 2:20 what his new FINISHED life looked like – it was no longer he that lived.. his life was lived in the awareness of Christ in him, as him. Paul lived a life that was completely free of any association with Adam and the fall… a life free of any association with sin and death… a life free of any association with any of the effects of the fall… sickness, disease, poverty, fear, etc. Purified…. Clean, pure, guiltless, upright, innocent, unstained, sinless — this is who you ARE – whole lacking nothing! What you believe about IT IS FINISHED determines the FINISHED life you walk out in this life.